Gaelin Rosenwaks is the Founder and President of Global Ocean Exploration. Always fascinated by the marine world, Gaelin began diving at 14 and has since continued exploring ocean ecosystems. She began her career at the Woods Hole Oceanographic Institution where she researched over-wintering patterns of Southern Ocean zooplankton. 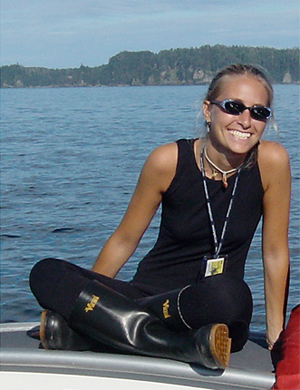 Gaelin earned her Master’s Degree in Coastal Environmental Management from Duke University working with the Tag-A-Giant program and conducting research on the migratory movements of Giant Bluefin Tunas. She has conducted fieldwork throughout the world from the Antarctic to the Arctic on icebreakers to both the Pacific and Atlantic Oceans on fishing vessels. To Gaelin, there is nothing better than being in the open ocean surrounded by endless blue water and passing wildlife. Alarmed by the changes happening in the oceans, Gaelin founded Global Ocean Exploration (GOE) in 2008 to share her passion for ocean exploration, marine conservation and photography. She now participates and conducts expeditions in every ocean to alert the public not only to the challenges facing the oceans, but also to what science is doing to understand these changes. Gaelin is a US Coast Guard Licensed Captain, and a Fellow of both the Royal Geographical Society and the Explorers Club where she served as Secretary of the Board of Directors. She also serves on the Conservation Committee of the Explorers Club and has been honored to carry the Explorers Club Flag on two of her expeditions to the Arctic. Gaelin has published articles in scientific journals, newspapers and magazines. She has also appeared as a scientific consultant and angler on the National Geographic Channel Series, Fish Warrior. She has delivered lectures at various institutions including the Explorers Club and Patagonia, Inc. Global Ocean Exploration Inc. © 2016 All Rights Reserved.